Experience seasonal wellness with fresh, locally-grown healing plants. We understand how challenging it is to find high quality ingredients for your projects. Why spend all that time and money making medicine from lifeless dried herbs you buy online and not use the best ingredients? Save money and boost your health by making your own medicine and food at home with the freshest ingredients possible. That immune syrup you’ve been buying at the store for $20 a bottle? As a CSA member you have access to all of the ingredients you need – why not try making it yourself with elecampane root, thyme, mullein leaf and elder flower? After a season with us your pantry will be full of homemade teas, tinctures, oils, salves, vinegars and dried herbs for cooking! New to using herbs? 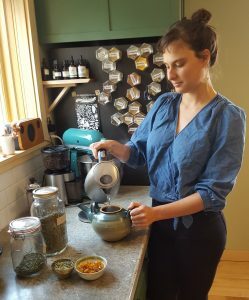 Before every share we send out an e-newsletter with info about the herbs, recipes and other resources to help you make the most of your share. Many of our members return year after year as they expand their apothecaries and pantries. Our fresh herb shares are composed of a diverse assortment of fresh medicinal and culinary herbs ready for home use. From roots to shoots to leaves and flowers, we grow an ever diversifying variety of herbs using sustainable and certified organic practices on our land in Florence or are respectfully wild-harvested in our area’s fields, forests, hills and valleys. Shares are available in the Pioneer Valley, Greater Boston & Worcester and New York City. Spring Add-on Box – Excited to get spring herbs like stinging nettle, cleavers, garlic mustard, japanese knotweed and more? Check out our spring add-on option. We grow over 80 different varieties of herbs – plants drawn from all corners of the globe and stemming from many ancient systems of healing. *select medicinals are in a multi-year rotation and are not available for harvest every year. View our crop calendar for our most updated list of herbs.